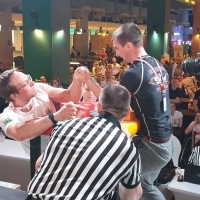 On March 17, 2018 the 2nd National Armwrestling Championship of the Republic of Moldova was held. I want to note that this tournament was preceded by 2 important events of our national level. On March 15, together with the Moldovan Anti-Doping Agency, a seminar on anti-doping, adapted specifically for arm-wrestling took place. Then, during the Championship, representatives of the Agency tested 3 athletes (1 - with disabilities, 1 girl, 1 senior). On March 16, a referee seminar was held, which was attended by 17 people, 4 of whom were first admitted to the refereeing. The new referees strengthened the team of 5 Moldovan judges already attested earlier and at the championship they were assisted by 3 invited, experienced WAF referees from Romania. Competitions were held at 3 tables. This time we had more objections in comparison with the last year. There were 5 objections, of which 3 were rejected. This Championship was our second and we can already compare some data. Firstly, 171 athletes took part in the tournament (last year - 95). Secondly, a new class for athletes with disabilities (PID) was introduced. In 2017, we had only VI and PIU classes. In the new class, 6 sportsmen were registered at once (next time we are going to approach the issue of classification more fundamentally). This year 74 juniors pulled in 3 weight categories (9 sportsmen in 2017). The youngest age of athletes was 14 years. 38 young athletes in 4 categories (24 last year). 7 participants in the category of masters (only 2 masters in 2017). The oldest age was 57 years. 14 female athletes in 4 female categories (6 in 3 categories in 2017). Among the Seniors, the main significant change in weight categories was introduced - we introduced a step of 5 kilograms and thereby duplicated the number of categories. Last year, this step was 10 kilograms. In general, the number of participants remained about the same, but the level of training of athletes has improved significantly and the struggle for a place on the podium was quite stiff. True, in almost every category the main struggle was for the 2-nd and 3-rd place, as there were obvious favorites in all categories. If mention names, Lilian Oprea easily won the right and left open among Masters. Mihaela Lazar is still so far out of reach for other girls. Daniel Procopciuc walked through the category of 80 kg and Open left hand. Also, Andrei Minascurta confidently became the absolute champion on the right hand after winning the category of 90 kg. So with the absolute champions, the situation of 2017 repeated. Like in 2017, the first place in competition of teams, was achieved by Moldavian State University of Medicine and Pharmacy, the second one - the team from Stefan Vodă and the third place - to the Moldavian State University of physical education and Sport. The emotional and exciting fights were at semifinals of the open category left and right hands. On the left, Andrei Minascurta and last year's Junior, European and World Champion Oleg Tudorean fought hard. And on the right, Oleg gave battle to Daniel Procopciuc. The whole event was broadcast live on national television. I also want to note that there were representatives of all state authorities responsible for the development of sports in Moldova and we received assurances that the armwrestling will be supported by the government. See you at the XIV Super Match! Jambul Vibliani: "Our athletes will definitely qualify for medals"